Isn’t it Barack HusseinObama that always accuses the GOP of playing politics? Um, Mr. President, who is playing politics with the Israel-Iran situation? Just when you thought you heard it all from this President. Barack Obama, the Campaigner in Chief, tells Israel to not at conduct a strike against Iran until after the 2012 campaign season. Is there nothing that Obama does not play politics with, including the safety of a nation and US national security. According to reports, “Obama insisted that any attack on Iran should be postponed until after the US presidential elections in November, possibly even until next spring.” UNREAL!!! Has this President no shame? 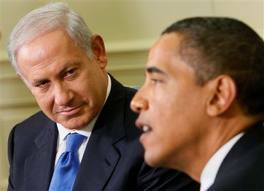 The caption for this should have been Israeli PM Netanyahu to Obama … What you talkin’ bout Willis? As stated at the Gateway Pundit, Heaven forbid that the safety of Israel and its people and US national security get in the way of Obama’s reelection. It has been Barack Obama who has been accusing Republicans and the GOP Presidential contenders of playing politics with the Iran-Israel situation. Maybe Obama would like to look in the mirror. After all, what could possibly be more important than “the Chosen One” other than maybe the “Chosen” people. SM: I must have missed Obama’s military service? Sadly, Iran probably already has a nuclear weapon or pretty damn close thanks to the weak BS punishments handed to Iran over the years and that included the Obama, W and Clinton years. Former Mossad chief Meir Dagan said that an Israeli strike on Iran would lead to a missile attack on Israel that would have a “devastating impact” on the country, the Haaretz reported on its website. According to Dagan, an attack will start a regional war. IMO. Israel should strike Iran when Isreal feels they should strike Iran. They should not take the advice of a foreign-born Chicago rabble rouser masquerading as president of the US. Obama has had no training in Middle East politics, only what he learned at his Muslim Step-father’s knee and what he learned growing up as a Muslim. I am sure this learning does not mean well for Israel. I believe Obama would sell Israel down the river at the drop of a turban….uh…hat. Yes that’s it. Hat. more likely, and, Israel would find itself alone IMHO. Obama is a chump ! where is Obama’s service record Enemy ? where are his scvhool records and why did he spend millions to have them sealed ? hiding your identity is pretty suspicious. i feel sure that your kind would crucify and republican running for office that wasn’t able to prove his citizenship. as we can see, everything Obama has produced has been proven fake. Israel is uninterested in Obama’s opinion and have already stated they will handle/decide their own destiny. They will strike Iran’s nuclear facility with accuracy and disable it. …if we had not sacrificed our brother, we would not have endured the same fate. My dad once told me, “As Israel goes…so goes the world.” I believe that is true. And Obama is willing to sacrifice Israel not realizing that it will mean the world goes into turmoil. Nowhere has Obama stated that he will leave Israel alone, nowhere. And if Israel attacks it has to be seen how succesfull they are. where is Obama’s service record Enemy ? it had ended when he was 15. Well Dork, you pop up like a pimple at the most interesting times! As for your comments, the majority of the other middle-eastern countries have been against Israel all along, so saying Israel will cause a war is nuts. What should they do? Wait until an atomic bomb falls on them? They are not going to take another holocaust (yes, it DID happen). As for global demonstrations against US/EU, tell me how that’s anything new? Multiple terror attacks? Again, what’s new? Moi, last time I checked Israel wasn’t at war with its neighbours…. Being against some1 isn’t the same as being at war with them. and which country would be stupid enough to nuke Israel? Iran, don’t think so, they know what will happen (certain death). and you may not like how Iran is run, but its their choice. and those demonstrations and terror attacks might not be new, but we can sure do without them. Israel is talking about war, Iran is talking about war, US is talking about war. Did I dispute that it happened? SM: Dolf, when a country has in its Constitution to kill Jews from the face of the Earth, I would dare say you are at war with them. What say you? What I say: that technicaly you are not at war unless war is declared. politics, just politics. He (Ahmadinejad) has to find a scapegoat for his failed interior politics and for his powerstrugle with the clercks (who have the real power). Iran will not use a nuke on Israel unless provoked. first: they don’t have 1.